The Kingdom Kids will hold its next Sunday Session on Sunday, December 12, 2018. The Apostolic Teens will hold its next Sunday Session Sunday, December 12, 2018. Your children will love our caring staff. Their goal is to provide the best possible care for your children while you are ministered to in our adult services. Teens will enjoy a high impact journey through God’s Word. A service packed with relevant praise and worship, games, and messages aimed at challenging children to serve God. Space is limited so arrive early! 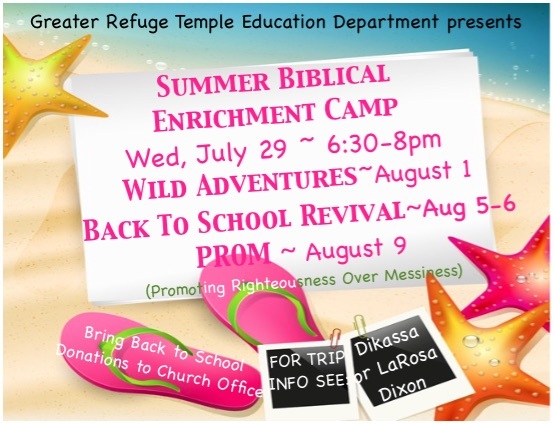 Don’t miss out on an opportunity for God to empower, enlighten, and revive! YOU are destined for greatness!